Dennis Duffey, who served the Ohio State Building and Construction Trades Council for nearly a decade as Secretary-Treasurer, retired on Sept. 1. 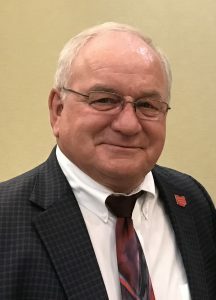 Duffey, who during his 45-year career served as the IBEW Local 8 Business Manager and past President of the Northwest Ohio Building Trades, was one of the driving forces behind the creation of Affiliated Construction Trades (ACT) Ohio. Since its inception in 2010, ACT Ohio helped create a bi-partisan building trades coalition in the Ohio legislature, which has been key in maintaining Prevailing Wage and stopping So-Called “Right to Work” legislation from being enacted in Ohio. In 2011, ACT Ohio and the OSBCTC staved off an attack on Prevailing Wage, when the Ohio House passed a $3.5 million Prevailing Wage threshold. Duffey worked with then Senate President Tom Niehaus to reduce the threshold level proposal to $150,000 preserved Ohio’s Prevailing Wage law, which remains one of the strongest in the country to this day. Mike Knisley, who was elected by the OSBCTC Executive Board to replace Duffey as Secretary-Treasurer, called Duffey a visionary leader. Mark Douglas, who elected by the OSBCTC Executive Board as the new State Building Trades President, said working with Dennis was an honor. In addition to his work with the State Building Trades, Duffey has served as a member of the Ohio AFL-CIO Executive Board since 2009. Duffey had also served on the Toledo-Lucas County Port Authority Board, the Toledo Labor-Management-Citizens Committee and on the Lucas County Democratic Party central committee. He briefly served as interim Lucas County Treasurer in 2005. A former amateur hockey coach, he was also the Past Commander of VFW Post 2898. Duffey is a U.S. Navy, veteran who served in Vietnam. He is married to his wife Kathleen and they have five children and 10 grandchildren. During a retirement party held in Columbus on Aug. 22, Duffey said he is looking forward to spending more time with his grandchildren and enjoy his interests, which include golfing, fishing, history and gardening. Sheet Metal Workers Local 24 wishes Duffey a long, healthy and happy retirement. We thank him for his service and his dedication to Ohio’s union construction industry.